Abbie Forbus is the Director of Teaching and Learning for KnowledgeWorks. 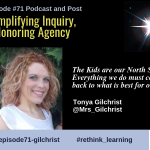 She taught for 15 years in Lindsay Unified School District in California starting in K-2, then high school counselor and eventually became Dean of Culture. In her new position, Abbie works with learning communities across the country to coach them in redesigning learning structures toward personalized learning. I have participated in several convenings with KnowledgeWorks since 2009 and learned about Abbie who is Director of Teaching and Learning and the Back to School Toolkit. I was excited to have a conversation with her and even met her in person at iNACOL. Below are excerpts from the podcast. I read that you worked with Lindsay USD for 15 years. Can you share your experiences there and what it meant to be the Dean of Culture? I taught K-2, then became a high school counselor, and eventually Dean of Culture of Lindsay USD. Lindsay implemented the Performance-based System during my high school counselor role. I remember going through transcripts of incoming freshmen from their 8th grade year and encountered three transcripts in a row that had a 0.0 GPA. 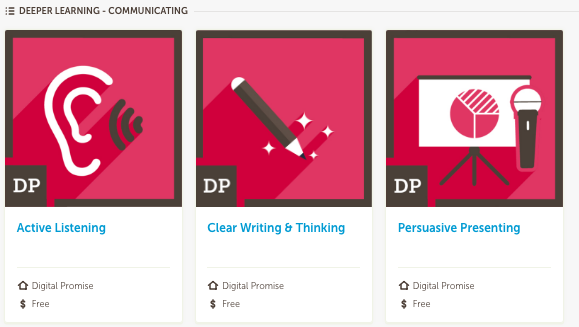 After starting PBS, where every learner was required to show mastery before being promoted, I was embarrassed about some of the things we had done in that traditional world…like a 9th grader failing English 9, then putting them in English 10 the next year…because they could take English 9 in their senior year when they had more room in their schedule. Your role as Director of Teaching and Learning for KnowledgeWorks? 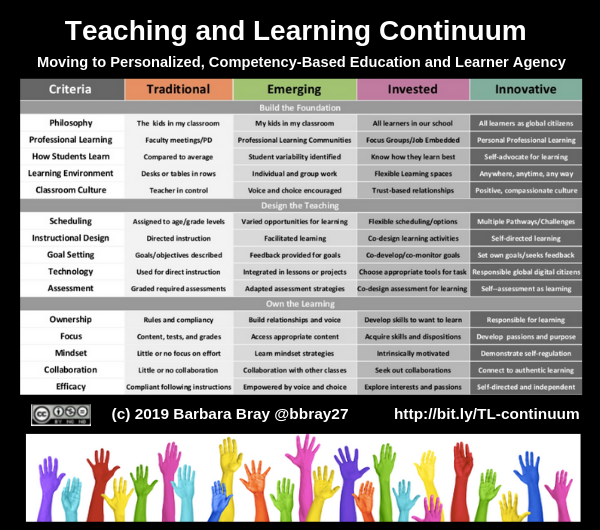 I get to work with various learning communities around the country who are working to create personalized, competency-based learning environments. At KnowledgeWorks, we are passionate about helping educators create learning environments that truly enable success for every student. One of my favorite parts of this work is that we work with districts who are ready for this work, and we personalize it for them. Our teaching and learning team jokes sometimes about the idea of slidedecks…since we tailor everything to the district, none of our professional developments are ever the same. We do a lot of research on our districts and get to know them really well which was one of my hopes coming in to this job. I worked in a rural community for all those years and would love when we had visitors come learn from us. I wanted to know what was happening “out there!” These districts we work with love their students and want to do what’s best for them. We use what we call the 10 district conditions for scale, which are things like learning environments, data systems, instruction, student supports, learning environments, professional development, leadership development, curriculum, assessment systems, technology, and partnerships. We know that when a district transitions to Personalized, Competency-based Learning, you can’t just talk about curriculum in isolation, We help districts create a system-wide plan to achieving their vision, understand opportunities for growth and build capacity for sustainable alignment in all critical areas. 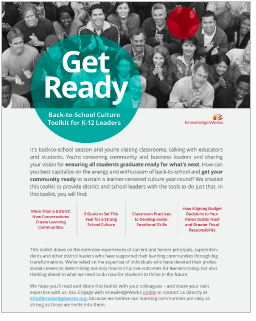 You had an integral part in developing the Back-to-School Toolkit from KnowledgeWorks. Can you share the toolkit? This culture toolkit is something that should be used throughout the year. Culture is something that learning communities and environments have to re-establish every year, but we all know we don’t just work on culture in August. We’ve drawn on the experiences of school leaders: superintendents, principals, teacher leaders who have done this work of Personalized, Competency based learning. The toolkit starts with how conversations create learning communities that create authentic engagement especially with families and the broader learning community. Authenticity—only ask if you really want to know. It’s more authentic. If you plan a parent meeting and no one shows up, you can’t just say, “Well, I tried.” Parents want to have a voice, they just aren’t used to being heard. And they are busy people so you have to work around their schedules which sometimes is really inconvenient…but I think you will find is a worthwhile investment. Transparency and culture is essential to this work. The importance of transparency and stakeholder voice was something I learned in Lindsay. I had this instinct to just do things myself, but I learned that if you stop to get the voice of your stakeholders, you get a better product in the end and don’t have to put out as many fires. The districts that we work with that have the greatest success have a vision that is aligned to the needs and desires of the communities they serve. We work with Garfield 16 SD in Colorado that received some parent feedback about lack of communication. They surveyed parents on how they wanted to receive communication and told the parents the results developing a communication plan around that. That’s transparency at its best! Community partners sometimes get put on the back burner because it can be very time consuming to involve the community. 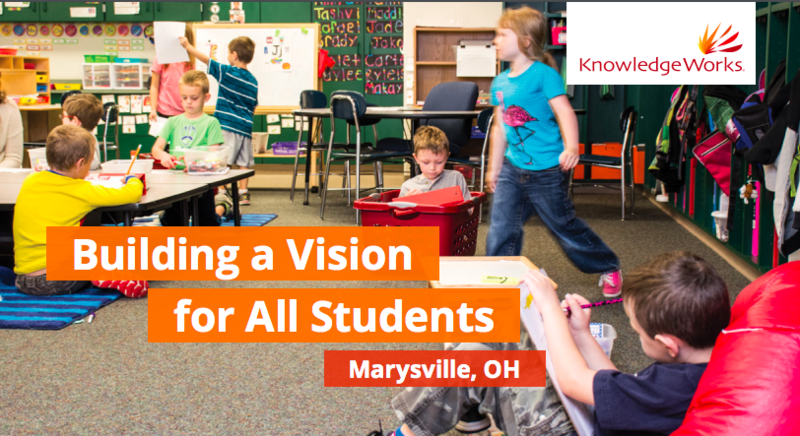 Marysville, OH is one of the district we work with 2013, Diane Mankins’ first acts were to hold more than 20 community meetings that were open to parents, educators, community leaders and stakeholders. She had two questions for attendees: What are you most proud of in our schools? And if you could wave a magic wand and change one thing, what would it be? Realized arrows were pointing in different directions. 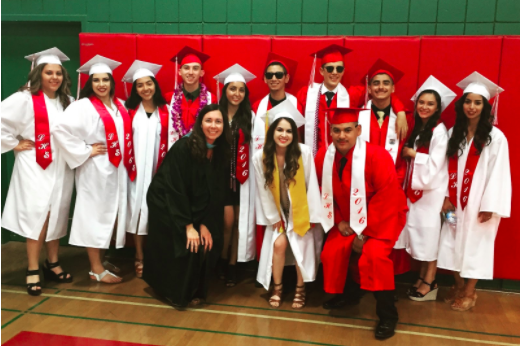 ensuring that Marysville graduates had a reason – and the desire – to stay in the community. Because they involved the community from the beginning, they now have strong partnerships and a phenomenal workforce development program that meetings the unique needs of their community. As administrators and leaders, we have to set the same expectations for transparency as we expect teachers to set with students. What do the learners think about this? Go to your critics? Why will this work or not work? The vision of RSU2 in Maine is to be a system of student-centered learning. It’s not just a poster that hangs in the district office or is put on letterhead…everything they do is tied back to their vision. We are doing some really cool work with learning continuums right now that I am excited about. We believe that having a transparent guaranteed and viable curriculum creates opportunities for student agency. It’s critical to creating an environment where all students can succeed. We don’t do that process for districts, we believe districts already have the knowledge and expertise needed to do the work, we just facilitate the process, which of course is customized to the needs of the district. Also, one of my favorite parts about working at KnowledgeWorks are the incredible resources and teams that I have access to. There is a team of education policy experts that advocate for legislation and policy that supports local innovation and meeting the needs of every child. And my absolute favorite team is our future forecasters that research and analyze drivers of change to help us look ahead to the future of learning and work, so we can take action today to better prepare students. 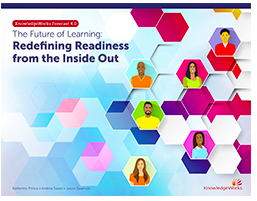 Their recent piece on The Future of Learning called: Redefining Readiness from the Inside Out, blew my mind…completely reaffirms the Why for the work we are doing with Personalized competency based education. In it, they talk about the signals of change that point to a decline in full time employment… which will lead to employees piecing together career mosaics..
Because they are piecing together jobs, the future workforce will need to be highly relations, hence the need for SEL…They need the knowledge, skills and dispositions to be able to do that! 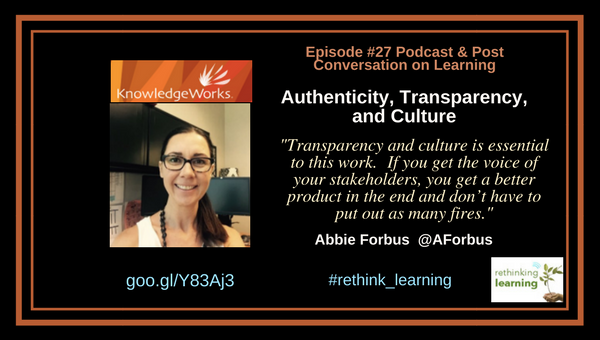 As a Director of Teaching and Learning for KnowledgeWorks, Abbie Forbus works with learning communities across the country to coach them in redesigning learning structures toward personalized learning. Prior to joining KnowledgeWorks, Forbus spent 15 years working with learners in Lindsay Unified School District, a competency-based learning community in rural Lindsay, CA. She served as a K-2 learning facilitator, high school counselor, and Dean of Culture. Abbie received a Bachelors in Elementary Education from Miami University, with a concentration in Spanish Language, and a Masters in School Counseling from National University. Are You Listening to Students? Krista Moroder is co-founder of NonQuixote, LLC, a video production company & brand storytelling agency. She is an educator, district-level administrator, and former project director on a storytelling & technology program at Digital Promise. 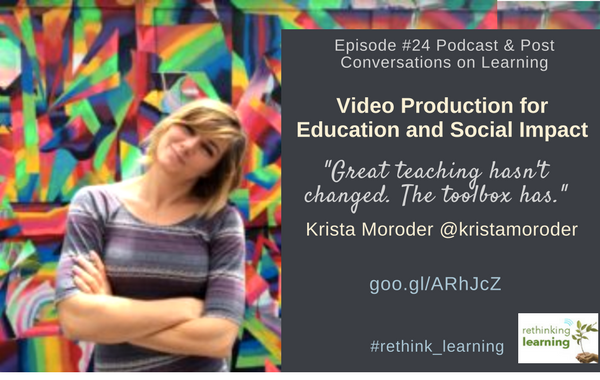 I met Krista in 2013 when she was at Kettle Moraine SD in Wisconsin and then followed her to Digital Promise. I’m really excited to find out more about her new venture in storytelling with her production company. I have to say I learned so much about Krista and even cried during the podcast. What an amazing story! Don’t miss Krista’s story and read excerpts from the post below from the podcast. Can you share your story about you, where you grew up, and your family? I grew up in Wisconsin in a big family and am a first-generation college student. My parents are very self-driven learners and set a great example for me. I spent a lot of time in the library and still check out books every time I want to learn something new. What is your background in teaching and using technology? This is kind of a strange story. I didn’t actually intend to become a teacher. I was constantly sick for the first few years of college. After a bone marrow biopsy, I found out that I don’t grow white blood cells on my own. It’s a random blood disorder called neutropenia sort of like the movie The Boy in the Plastic Bubble. If I get sick with a cold, it will turn into a life-threatening situation within days. I have a medical bracelet, carry a card with me, and give myself shots in the stomach twice a week to jumpstart white cell production in my bone marrow overnight. Because of that, I had a very different college experience. My sole focus was getting a job so that I could immediately support my very expensive medical issues. In the last decade, I’ve been to the hospital hundreds of times, had four bone marrow biopsies, and given myself thousands of shots. So the real reason I chose to become a teacher had absolutely nothing to do with me wanting to make an impact in education. I needed a stable job with really good health insurance. Despite all the craziness happening in politics, teaching is still pretty stable. And at the time, teachers in Wisconsin had some of the best benefits in the state. The technology was added to the equation once I was in the actual classroom. I immediately started getting sick from touching student papers (germs can live up to three days). I started using technology to put a buffer between me and my students and ended up seeing a lot more benefits – like giving feedback throughout the whole writing process. 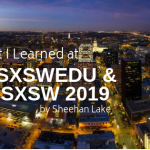 I started sharing what I was learning, got an award from ISTE, eventually took a job as the Director of Education Technology for another school district, and ended up with an entire career that really spawned out of a very logical, unpassionate decision. When and how did you get involved with Digital Promise? 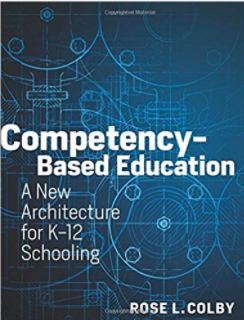 I became interested in the idea of competency-based professional development while I was working in the Kettle Moraine School District in Wisconsin. My superintendent (and one of my mentors!) 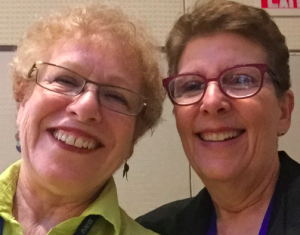 Pat Deklotz was all about challenging the status quo, and we agreed that it didn’t make sense to have hourly-based training for a teacher when we were trying to move away from seat-based time for kids. 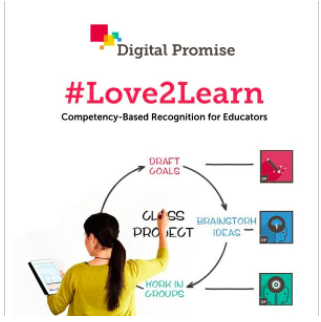 I did some research, saw that Digital Promise was planning on starting a micro-credentialing program, and realized that I could potentially help us shift that model by getting involved. 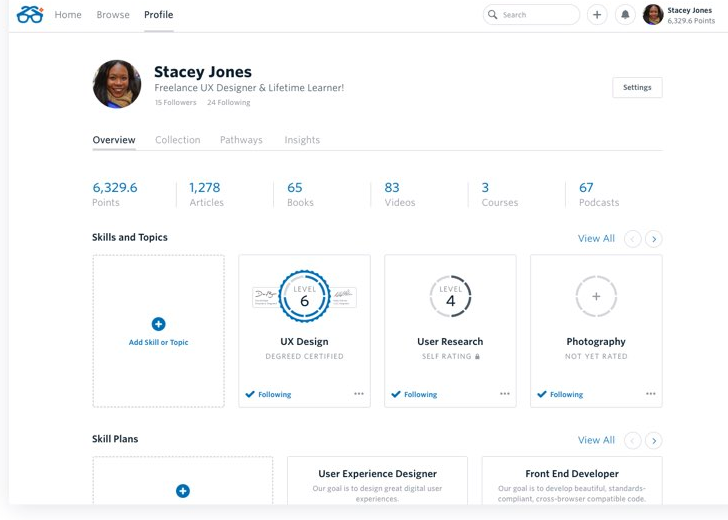 I was hired at Digital Promise as the project manager for the initial launch of micro-credentials, and Kettle Moraine became one of the biggest pilot users of that program. After we launched the micro-credentials program, I moved to another program called the “Verizon Innovative Learning Schools” program about bringing technology and storytelling programs into schools across the country. The goal of that project was to create a guidebook for how to do 1-to-1 programs in schools, so we created a framework from a lot of the lessons learned. What did you do after you left Digital Promise? I accidentally ended up on a speaker panel while I was at Digital Promise about the importance of teaching young women to code. It was at the YouTube headquarters, and I think they wanted Karen Cator, my boss to speak, but she had a conflict that day. 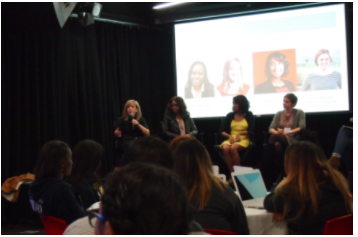 So it ended up being me and three other women: the CEO of change.org, the head of engineering at YouTube, and the head of diversity for Google. They were amazing. They were totally out of my league. They also all knew how to code. I felt totally unqualified but also totally inspired by these women. I’m so excited about your new venture NonQuixote. Can you tell me how your company came to be? I’ve always wanted to be self-employed but my biggest barrier was always health insurance– my medicine costs about $7,000 a month. In February, I was put onto a research study where I would start getting my medicine for free. So after 10 years, I had finally gained my freedom. So I started thinking about making a move. Two months later, in April, I went to Arizona to visit a former colleague from Digital Promise. He’s an independent filmmaker who I teamed up with on a project just a few weeks before I left. The more we talked, the more we realized we wanted to work together again. About the same time, I started getting offers to help schools figure out coding and get back into public speaking. I decided it was time to jump into self-employment. What do you mean about a brand storytelling agency? Marketing is no longer about just the products– we follow brands because we trust them and because they reach us emotionally. Here’s an example. We just wrapped up a commercial last week for this product that is an alternative to the cotton swab. Part of the reason we were drawn to helping this company was that of the founder, Lily. She is a 30-year-old CEO and started her company after getting a patent for inventing this product. It would have been very easy to film a 1-minute video about this device, but that type of a video is a dime a dozen. We decided to cast the younger version of her and create a short video showing the importance of teaching young women to be curious so they grow up to be inventors. Every story you tell is a chance to share your values, and we wanted to show Lily for the inspirational, empowered female leader she is. The primary focus of our company is video production for education and social impact organizations. It is SO important for these organizations to story tell – the funding, resources, and support always go to the people who share the good things they are doing. I’m so lucky to work with Ian, my co-founder. He’s won multiple awards and his work is top-notch. I’m blown away every time I see what this camera is capturing. He’s the type of person that could make a lot more money in the Hollywood system– but is dedicated to using his skills to make a positive impact. We have the worst business model– there isn’t a lot of money in video production, and even less when it comes to working with these types of organizations. Luckily we can charge less than almost anyone else (even companies that are local) because we don’t have an office or any overhead costs so we still get work. But you know what? The best advice I got was that there is nothing more valuable than making a living just being yourself. So as long as I can pay my bills, I don’t care. I’m so grateful every day that I don’t have to worry about my medical expenses and that I can do what I enjoy: meet people, tell their stories, and share the cool things they are doing with the world. I love your passion for stories and film. Can you share some of the stories and films or anything else you would like to share what you are doing now? Well, I can give a little teaser… Ian and I in the development stage right now for a feature documentary about some of the best things we’ve seen in education over the last ten years. I’m sure I’ll have more to share soon! Krista Moroder is the co-owner of NonQuixote LLC, a brand storytelling agency, and production company based out of Los Angeles and San Francisco. She is an award-winning educator, award-winning district-level administrator, and former project director on a $40 million storytelling & technology program at the Congressionally-authorized NGO Digital Promise. She’s also been a full stack software engineer, a theater technical director, an international public speaker, and an advisor for organizations that include the International Society for Technology in Education, the Wisconsin Department of Public Instruction, and the Google in Education team. Since 2008-09, New Hampshire high school students have been able to work with educators to create personalized learning plans—with course credit awarded for mastery, not time in class. Time in class is based on the Carnegie Unit or seat time. 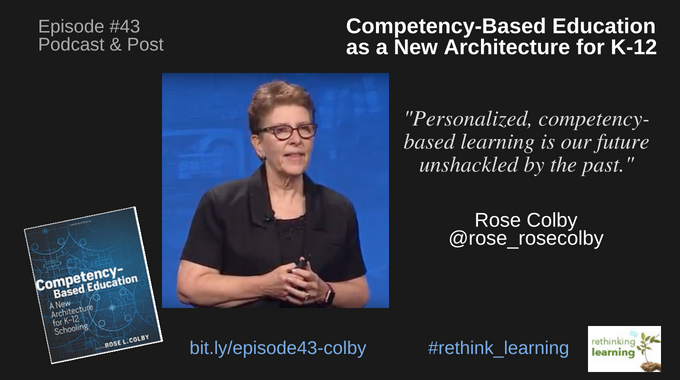 Demonstrating what you know based on mastery is called “Competency-based Learning.” Rose Colby and Fred Bramante wrote “Off the Clock: Moving Education from Time to Competency.” about New Hampshire’s journey to personalize learning. Rose shared with me their story. I bought their book. I’m curious and want to see how this works. How does this work? Academic credits can be earned year round through internships, online courses, overseas travel, or attending face-to-face classes. Mentors and/or educators set course-competency guidelines, track progress, and conduct final assessments. Assessments are based on Webb’s Depth of Knowledge (DOK). DOK, created by Norman Webb from the Wisconsin Center for Education Research, is the degree of depth or complexity of knowledge standards and assessments require; this criterion is met if the assessment is as demanding cognitively as the expectations standards are set for students. DOK refers to the complexity of thinking skills that a task requires. 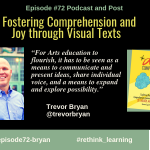 DOK implies the interaction of how deeply a student needs to understand the content with different ways of responding and interacting with the content. The level of a DOK item is determined by the task (defined by complex thinking and reasoning skills), not grade level or ability of the student. Therefore, the DOK of the task does not change with grade or ability of the student. Multiple-choice questions can be written at a DOK 3 or 4 level; however, to design a question in this format is difficult. An Item at DOK level 3 or 4 requires complex reasoning, strategic and extended thinking about the concepts of the content and a real world context, and especially at a level 4 that requires research, investigation and application often over an extended period of time. The book Off the Clock: Moving Education From Time to Competency by Fred Bramante and Rose Colby provides a comprehensive approach to implementing a large-scale competency-based reform initiative that bases student achievement on mastery rather than “seat time.” This is about the journey that New Hampshire started in 2005 when their state Board of Education revised school approval laws. Learn about a system that is grounded in the passion of the student and experience learning opportunities. This book is about the ideology of moving from the Carnegie unit “seat time” to having students demonstrate mastery. Competency implies that students have the ability to transfer content and skills across content areas. This is just what we need to personalize learning. After we read the book, talk to the authors, we are going to add stories, data, webinars, and encourage discussions that lead to more discussions about competency-based learning. This book is highly recommended before you have any discussions on personalizing learning. Fred, a former middle school Science teacher, a former candidate for governor, a life long entrepreneur, and a past Chairman and long standing member of the New Hampshire State Board of Education, led a full-scale effort to redesign public education, especially at the high school level, which resulted in a major revamping of New Hampshire’s education regulations and the subsequent development of the New Hampshire vision For High School Redesign. Fred has been the public voice of this movement and has carried the competency-based message around the country. Rose Colby is currently a Competency-Based Learning and Assessment Specialist assisting high schools throughout the state of New Hampshire in designing high quality competency, assessment, and grading reform systems. Ms. Colby is a motivational speaker and presenter in the areas of competency based learning, digital learners, differentiation, and school leadership. Since 2007, Ms. Colby has been a partner in the Nellie Mae Education Foundation funded project centered on student success though Extended Learning Opportunities in partnership with Q.E.D. Foundation, Plustime, NH, and the NH Department of Education. She is currently part of the planning team for the N.H. Next Generation Learning Project. Check out their website www.offtheclockeducation.com for more information. Think of your students working at their own pace. Teachers are overwhelmed as they try to meet the needs of all their students. With our current one-size-fits-all system, many children are being left behind and dropping out. By aligning all of our resources (in schools, the community, and online) around student learning to enable students to progress upon mastery, our country can increase productivity in the education system, while simultaneously raising achievement levels overall and reducing the achievement gap. Students advance by demonstration of mastery, not age. Students are evaluated on performance. 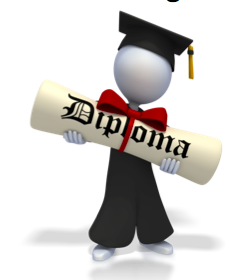 Some students complete courses at different rates than others. The student and teacher relationship changes. Learning goes beyond the classroom and can be anytime, anywhere. Schools focus on formative assessment. Teachers collaborate to develop understanding of what is an adequate demonstration of proficiency. Skills or concepts are assessed in multiple contexts and multiple ways. 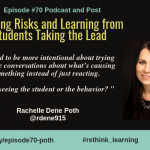 Attention on student learning, not student grades. Summative assessments are adaptive and timely. Students progress at their own speeds and students that are proceeding more slowly will need more help. 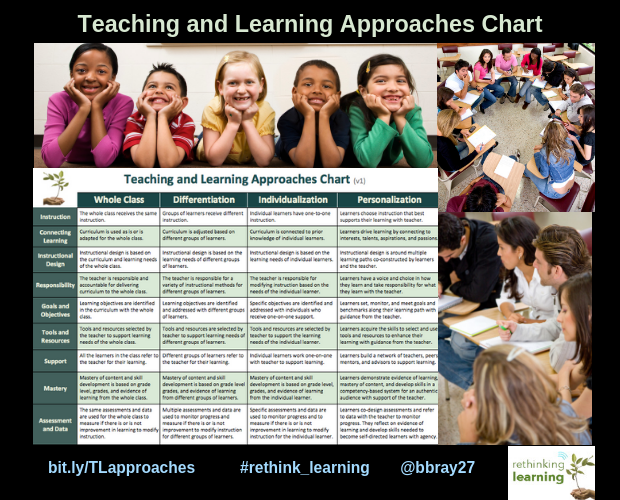 Personal learning plans identify learning styles, context, and interventions that are most effective for each student. New specialist roles may develop to provide high quality interventions when students begin to slip behind. Online learning can play an invaluable role in providing feedback to teachers on how students are proceeding. 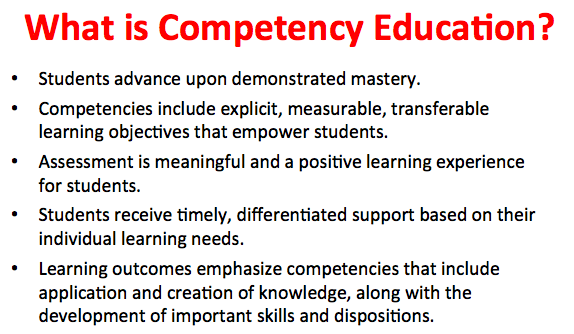 Competencies are designed so that demonstration of mastery includes application of skills and knowledge. Assessment rubrics are explicit in what students must be able to know and do to progress to the next level of study. Examples of student work that demonstrate skills development throughout a learning continuum will help students understand their own progress. 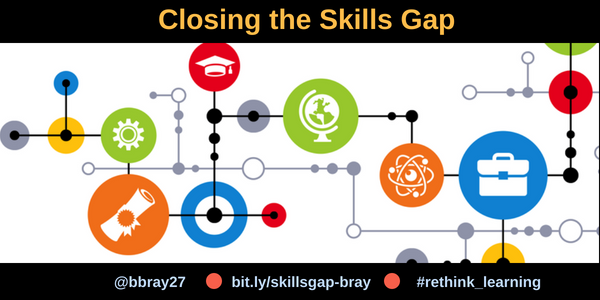 Lifelong learning skills designed around students needs, life experiences, and the skills needed for them to be college and career ready. Expanded learning opportunities are developed for students to develop and apply skills as they are earning credit. Businesses, Universities, Community Colleges, and Technical colleges are looking at competency-based systems for career bound students and job seekers. There is a need to address and accept existing knowledge and skills people have no matter what age. What about providing a system in K-20 for learners to challenge a course or test? This could actually be a way to move people through a competency-based system where life skills and background knowledge mean something. It will be interesting to follow innovative practices where schools take risks to address each students’ needs and learning styles. It is time to “think out of the box” where failure is not an option anymore. We cannot leave one child behind. Every child is important. This is their future and right now — today — isn’t looking very promising for them. Schools have to change. We cannot look back anymore and say “if it was good for me, it’s good for my child.” That doesn’t work anymore. The world is different. We tried the “one size fits all” now for a long time. We have more children left behind than ever. Let’s look at personalizing learning and competency-based system models. How about learning modules that are available when a student needs an answer or a question? 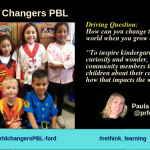 How about teachers as personal learning coaches? I am going to showcase different schools and innovation centers where the focus is on learning and meeting the needs of each student. Are you with me? I submitted an idea for the Grand Challenge about Designing Creative Learning Environments. Check it out. Vote. Comment. Leave a comment here.